Description - Take your indoor athletic space to the next level with our Elevate Golf Turf Rolls. Great for all types of indoor activities, this cleat friendly turf is very easy to install and maintain. Featuring an attached foam pad for added shock absorption and stability, this fake grass is perfect for practicing golf shots, indoor soccer, football, and much more. With two different bulk levels, this turf is better looking and less abrasive than our other Elevate Turf Rolls. A 10-year warranty backs our Elevate Golf Turf Rolls. Material – Nylon fiber with a urethane foam backing. 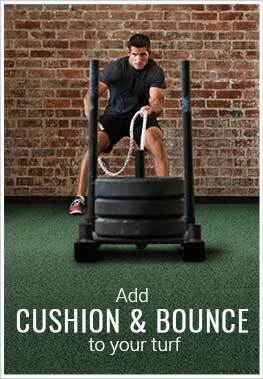 Weight – The urethane backing with foam weighs 1.4 Lbs. per sqft. Recommended Uses – Our Elevate Golf Turf Rolls are the perfect flooring option for any indoor athletic facility and is commonly used as flooring for practicing golf, indoor soccer, football, as batting cage turf, for CrossFit gyms, in multipurpose gyms, and much more. Do you have BE Bentgrass? You can a Bentgrass look in our putting green turf products. Our Premium Putting Green Turf Rolls and our Elite Putting Green Turf Rolls are our top two sellers. Does this have a cushion? Can I hit a ball from this surface? Can I order a 5'X4' size? Our Elevate Golf Turf Rolls do have an attached cushion. You can hit a ball off of these rolls. They were made to used for this purpose and are commonly used as fairway mats for indoor golf. The smallest size roll that you can order is a 15' x 1' roll. If you would like a smaller size, we do offer a wide range of mats that would fit your criteria on our Putting Green Mats page.